We have more than half of the MLB season left to play, and yet the number of teams that still have a legit shot to win the World Series is only nine, and three of those teams are heads and shoulders above the rest. 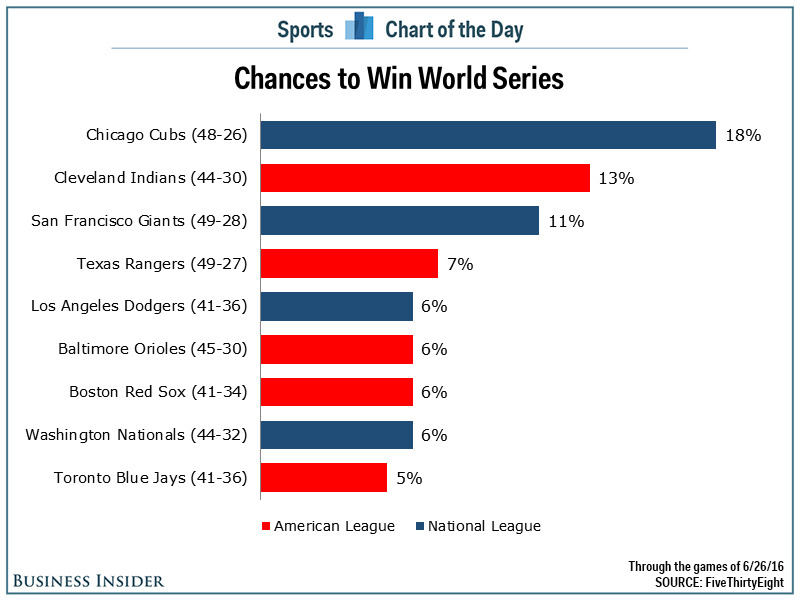 The Chicago Cubs remain the heavy favourite, with a 18% chance to win it all, according to Nate Silver’s Five Thirty Eight. The Cleveland Indians have separated themselves from the pack in the American League, with a 13% chance to be World Series champs. The San Francisco Giants (11%) are the only other team above 7%. In all, there are nine teams with at least a 5% chance of winning the World Series — see chart below; record in parentheses.